I never realized what I liked about toffee so much until I tried Miss Kelly’s Candies. Super crunchy hard and a deep salty caramel flavor – almost to the point of burnt – is what I realize now defines great toffee for me. A light layer of chocolate will add that smooth sweetness and then sprinkle on top a smattering of nuts – usually pecans and maybe almonds. Sounds easy to make but I’m sure it isn’t. 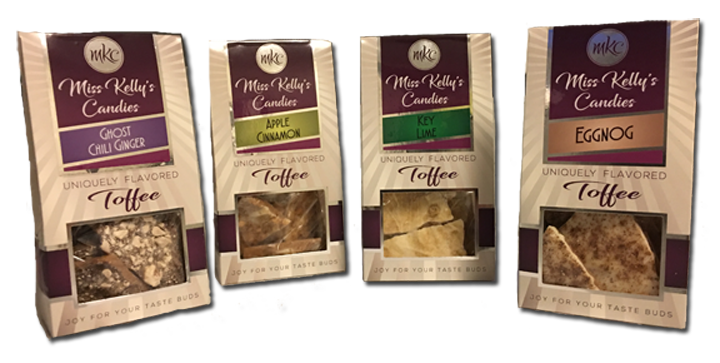 Miss Kelly’s Candies toffee moves the focus off the tried and true toffee flavors, into a slew of homemade gourmet ones. Jonny and I split up the goods and I got Key Lime, Eggnog, Apple Cinnamon, and the toffee that intrigued me the most: Ghost Chili Ginger. The flavors are generally right on – I knew right when I put them in my mouth what I was eating. The eggnog had nutmeg baked in, and the Key Lime had that sweet & sour lime tinge only those pies have. I didn’t love the Apple Cinnamon, it was more apple than cinnamon and tasted like an extract and not actual apple or cinnamon. As it turns out, and as I expected, the Ghost Chili Ginger was my favorite. The ginger wasn’t overbearing but definitely present, and the heat from the peppers was very real. Not just hot – but there was true Ghost Pepper flavor as well. So real, that there’s almost no way the faint of heart – or kids – will like these. Simply too hot. What I really liked about the Ghost Chili Ginger? They were the one flavor of the four that had that old school toffee-ness. You can kinda see it in the picture (above, far left): the dark brown cooked sugar color, the nuts on top, thicker brittle. This toffee was harder than the others and more toffee than topping. Kudos to Miss Kelly for making small batch, highly edible, unique toffee candies. These aren’t your run of the mill “I’ve-had-these-before-they-taste-like-what-toffee-always-tastes-like” toffee. On the other hand, I kinda missed the old school. So my suggestion is you get a few clever flavors but make sure you have some of the good ol’ tried and true nearby to cleanse that candy palate of yours. For those of you with allergies, check the ingredients. Also, Miss Kelly has some recipes that are gluten free. Go forth. Buy! Give to friends! Keep the small businesses alive and well!